Hello guys, Today I’ve got something very useful for gaming lovers. In this article, I am going to show you how to download and install Subway Surfers on PC. You may have played Subway Surfers on your Smartphones, but so many people are looking to play Subway Surfers on PC/Laptop. Playing Subway Surfers on Windows PC will give you good experience and enjoyment because it is on somewhat big screen. After writing a wonderful guide for installing WhatsApp for PC, many of my blog readers are inquiring me how to install Subway Surfers on the laptop. So, to fulfill their desire I’m back with this special session to download Subway Surfers for Windows 8.1 or Windows 8/7 PC, follow these simple steps and enjoy playing. Probably said, foremost you need to download the software which enables playing Subway Surfers on your PC. Without this, you can’t play Subway Surfers on PC. So, pay attention to these following few steps. Firstly download BlueStacks by hitting below download button. Download BlueStacks – It’s Free!! Now open the downloaded setup file and install it. If you get through this installation of BlueStacks, next step is installing Subway Surfers on Windows PC. 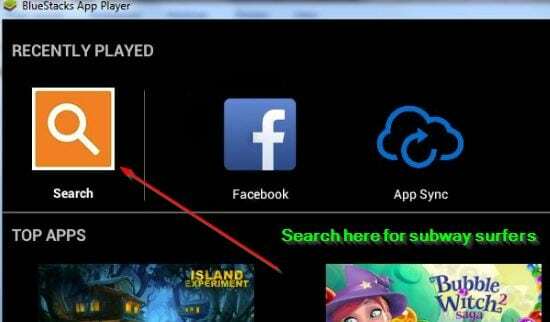 To install Subway Surfers on PC, open BlueStacks and follow the below steps. It can be finished within few minutes. Here is the clear explanation of installing Subway Surfers for Windows 10 PC/laptop with the images. Go to “Search” option at the top and type Subway Surfers. Click on “Search Play for Subway Surfers”. Download Subway Surfers by just clicking on the icon. You are almost done! After doing this perfectly, Subway Surfers will be download and get included in the app list of BlueStacks. Now, what’s remaining is knowing how to open and play Subway Surfer for Laptop. To play Subway Surfers game for PC, just open BlueStacks and click on the icon of Subway Surfers. Go through these images, you will do it better. Open Subway Surfers and have fun. For the first time, it will take few seconds to get ready and from next time it works fast. Let us know the game play and what keys you have to use in order to play Subway Surfers for PC. 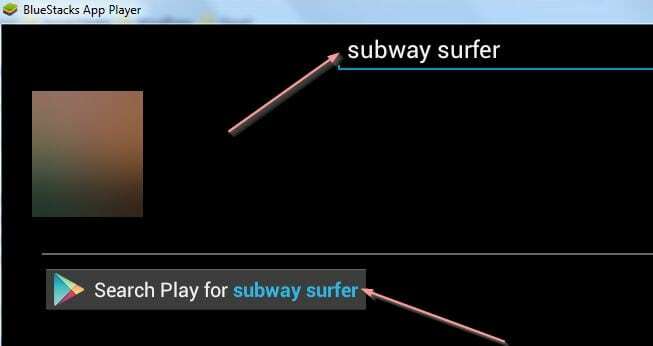 You can play Subway Surfers by using a Touch pad (Mouse) or with the Keyboard. If you play with Keyboard, the playing keys will be – Move right (Right Arrow), Move left (Left Arrow), Jump (Up Arrow), Roll (Down Arrow) and to get Hover board (Space). Coming to using the mouse, you have to swipe it in all four directions based on which way you have to go. To get an Hoverboard, double click on the game window with the mouse.Have a look at some of the extraordinary things about Subway Surfers those are attracted people concentration towards this game. Let’s see some of the impressive attributes of Subway Surfers game. If you run a long way down the track, you can get a huge amount of coins. Sometimes you will get the bonus coins collecting when you get the. You can buy Hover board and upgrade the characters also with these coins. This Hover board protects you from crashing for 30 seconds. There will be missions and daily challenges when you play your natural game, you will achieve them one by one. Games are also there like this one, for example, Temple Run and Temple Run 2. You can play these games free on online. Playing this kind of arcade game in Android mobile and PC will be different. It gives you more thrill and joy when you play it on PC. Run as long as you can, earn more coins. That’s it, for now, guys, enjoy the game. 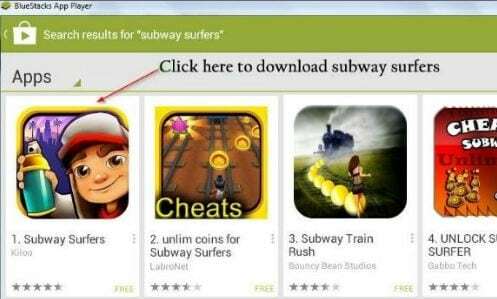 Now you came to know the method of downloading Subway Surfers for PC. I hope you all understand and do this without any problems. If you have any queries, please let us know. We are here to aid you. If you found this tutorial assistive, please don’t forget to share this on Google+, Facebook, Twitter. Subscribe to our blog for tips and tricks. It’s a good game BUT can I play without BlueStackssssssssss or nott??? ?